The School of Optometry and Vision Science held the annual Low Vision Day for Part V Optometry students in March. This day is designed to increase knowledge of the difficulties patients with vision impairments have, utilising a range of activities. Volunteers formed an interactive panel to take questions from the students, which included “How do you select which clothes to wear that day?” and “How do males aim for the urinal?” resulting in an engaging session with periodic roars of laughter. Low Vision history, vision and refraction skills were enhanced as the students examined demonstration patients who kindly gave their time. 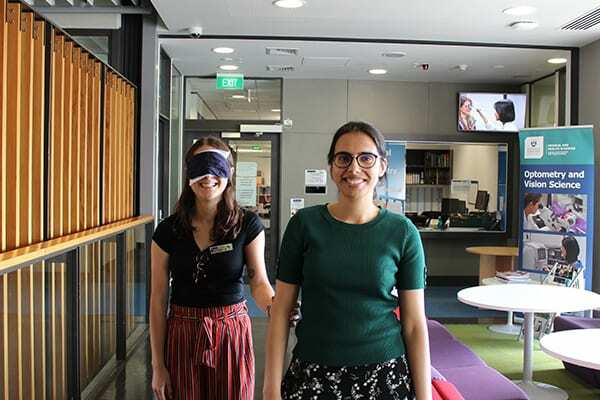 Being guided around by a sighted person while blindfolded was a shock to most students and allowed them to relate to people with blindness and vision loss. A variety of technological visual rehabilitation tools, from accessibility features on phones and computers to closed circuit television, google home assistant and refreshable braille displays were also introduced to the students during the hands-on session. Special thanks go to BLENNZ, the Blind Foundation, SOVS staff and the volunteer people with low vision and visual impairments for making this day possible.